Embiid's left knee pain has gotten worse in recent days, the center says. Before the Sixers could lay it out in black and white on an official team medical report, Joel Embiid cleared the air about his problematic left knee at Friday's practice. Asked if he could share any insight about his availability heading into Game 1 against Brooklyn, the big man probably scared the life out of thousands of fans with his answer. "I have no idea," Embiid said Friday. "[It's] just about the pain in my knee. Just got to keep working through it and see how I feel every day, and you never know what's going to happen." Tendonitis appears to be the issue at hand for Embiid, who says he has been doing rehab and using a lot of ice to manage the problem at hand. That is a pretty standard response to tendonitis in the knee, but the concerning thing is that the Sixers have gone far out of their way to find time for Embiid to rest, only to arrive here anyway. 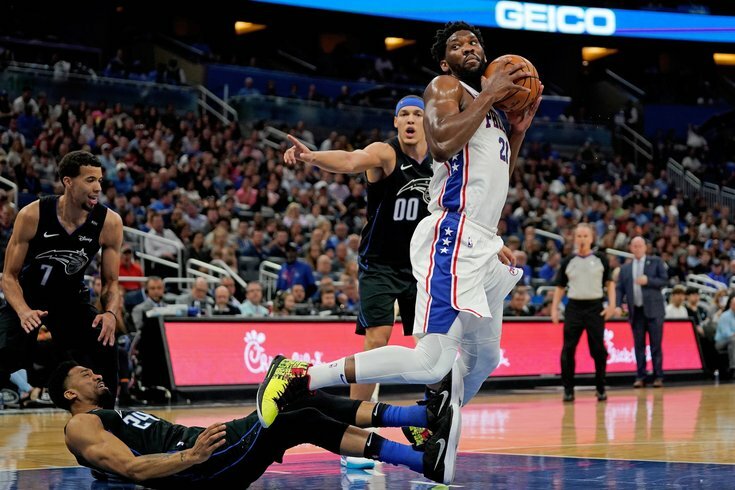 Embiid, who says he has been dealing with the same issues since the team emerged from the All-Star break, missed 13 of the team's final 23 games due to "load management," which the team initially downplayed when they discussed sitting him for the period immediately following the break. In fact, when you speak to the medical people, one of the things that at times exacerbates it is time off. You know to keep your core, your quads, etc. strong, and just try to have some level of maintenance, is really in a prescribed area, their recommended area, and maybe time off actually did more harm than good. But the bottom line is, nobody needs to read into anything here. This is an NBA athlete that has some soreness in a knee, that has had an MRI, and we all should move on. We'll miss him obviously, playing wise, but it's not anything that isn't completely pointed toward keeping him ready, and especially ready when it matters most at the end of the year. You don't want to develop muscle atrophy during time off, obviously, but reducing strain on the body is basically the only way to fix tendonitis. And they've certainly tried to buy him time on the sideline while using him selectively against Eastern Conference contenders down the stretch. Beyond that, the team's plan to get him ready for the end of the year has all added up to Embiid being, at best, a game-time decision heading into Game 1 of the playoffs. I don't think anyone should overreact and suddenly pick Brooklyn to win the series if Embiid misses time, but there are implications for the playoff run here either way. How will Embiid's body hold up if they make the deep run they're hoping for? What sort of cardio shape is he in, and how quickly can he get back up to full speed? For those of you who thought this was just about gamesmanship, Embiid is many things, but he's not great at hiding his feelings. And you could hear in his voice that this is not some ploy from the Sixers to change Brooklyn's approach, nor is it something that should be taken lightly. After trying to play himself into shape in the middle of the Miami series last year, he could be facing the same problem against Brooklyn. "It's frustrating, [it's] the second time, last year it happened. Extremely frustrating, I'll tell you that," Embiid said, "but you can only control what you can, and that's the work I put in every day. How I treat my body, how I take care of it, and I guess the rest is going to follow." "It's my decision because I'm the one feeling the pain. I know my body, so these guys, they're going to do whatever they can as far as getting me ready and healthy. But if my body doesn't respond based on the pain level, there's really nothing you can do." If Embiid is at a point where the pain is severe enough to make him consider not playing, that should say it all. He has consistently lobbied the Sixers to let him play more and more after missing his first two seasons, which makes this all the more concerning. And despite all the previous rest, it's a problem he says isn't getting a whole lot better. "Whatever I've been feeling the last couple days has been different. It still hasn't changed, everything was good on the scans and everything, but the pain level has just changed. It just got worse," Embiid said. "I think everybody that knows me knows that I always want to be on the floor, and I always play through injuries and pain and everything, but if I can't go, that means it's pretty painful...I'm still glad there's nothing else going on [structurally]." This is a story that will likely have more twists and turns before the playoffs are over. Stay tuned. UPDATE: As of the 5:00 NBA report deadline on Friday evening, Embiid is officially listed as doubtful for Saturday's game against the Brooklyn Nets with left knee soreness.